Mark Noble of West Ham United clashes with a fan. 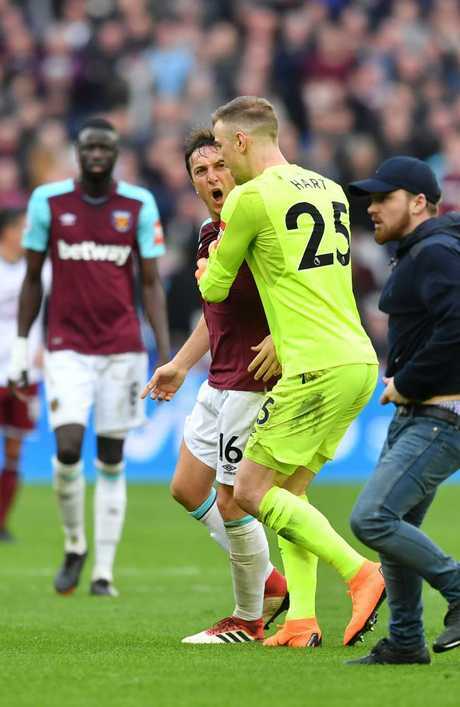 PREMIER League strugglers West Ham United were left facing disciplinary action after angry fans repeatedly invaded the pitch in shameful scenes during a 3-0 loss at home to Burnley on Saturday that left the London club just three points above the relegation zone. 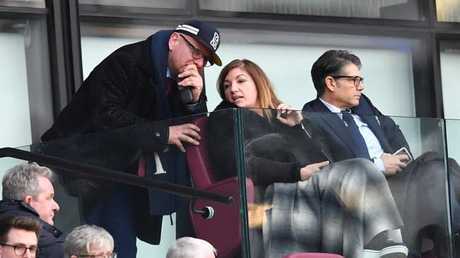 Hammers co-owners David Gold and David Sullivan had to leave the directors' box for their own safety as the London Stadium descended into chaos. A week that had already seen a planned protest march by fans against the club's board called off -- as West Ham supporters' associations fell out with each other amid threats of violence from a group linked to the club's notorious hooligan past of the 1970s and 1980s -- turned increasingly toxic in the second half of a painful defeat in east London. 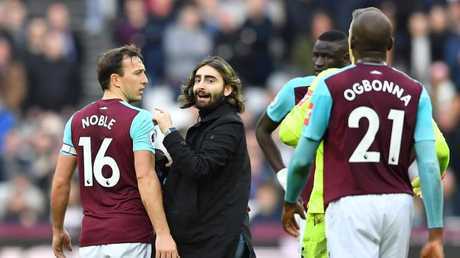 Ashley Barnes had just given Burnley the lead early in the second half when a fan ran unchallenged onto the pitch before Hammers captain Mark Noble shoved him to the ground. As that supporter ran back towards the stands two more came on, with home defender James Collins eventually ushering them away. 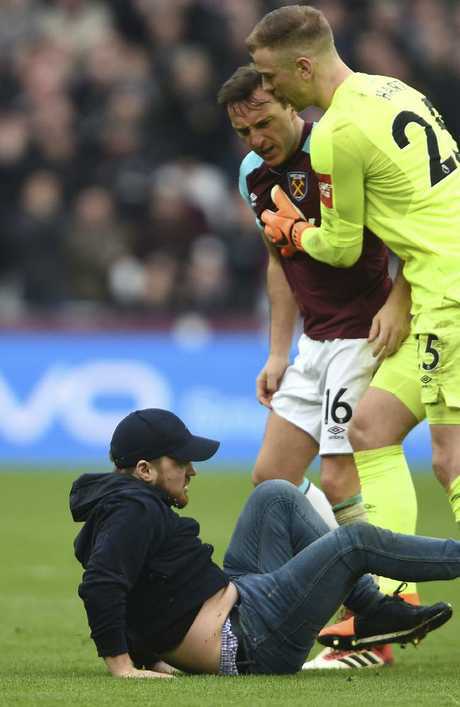 A Pitch invader falls to the pitch confronted by West Ham's Mark Noble, with goalkeeper Joe Hart, right. Burnley's second goal, scored by Chris Wood, prompted the most furious reaction, with hundreds of fans charging along the concourse of a stadium they detest to gather under the directors' box and chant "sack the board" and "you destroyed our club". That second goal -- Wood was to add Burnley's third nine minutes from time -- also saw one fan pick up a corner flag and march to the centre circle before planting it in the ground. Once more the stewards were seemingly powerless to intervene except to ask Gold and Sullivan -- whose decision to quit the east London club's longstanding Upton Park ground for a move to what was the 2012 Olympic Stadium is behind many fans' fury -- to leave their seats. 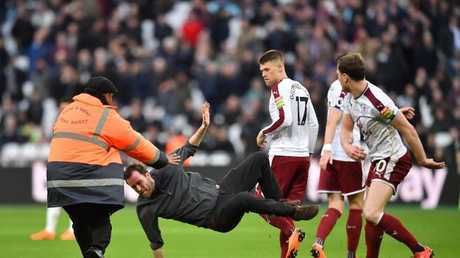 Burnley's English striker Ashley Barnes trips up a pitch invader. Meanwhile Burnley's coaching staff allowed children caught up in the chaos to shelter in their dug-out. 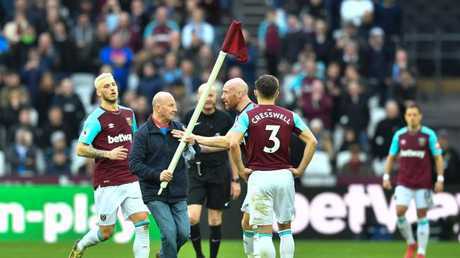 Despite a couple of delays, the match was played to a finish and afterwards Hammers manager David Moyes told Sky Sports: "We want the supporters behind us, but you can't cross the line and come onto the pitch. "I don't think I've been at football games in my time where I've seen that. "All I'll say to all of them is that we need them. We're fighting for points. We're all in it. The players know we did well today for long periods. "We didn't do so well for a couple of minutes in the second half. We needed the supporters with us in a different way. "All I ask for is that everybody sticks together and we try to get ourselves enough points to make sure we're a Premier League team (next season)." Meanwhile, West Ham promised to take "decisive and appropriate action" after completing a "full and thorough investigation" into Saturday's events. 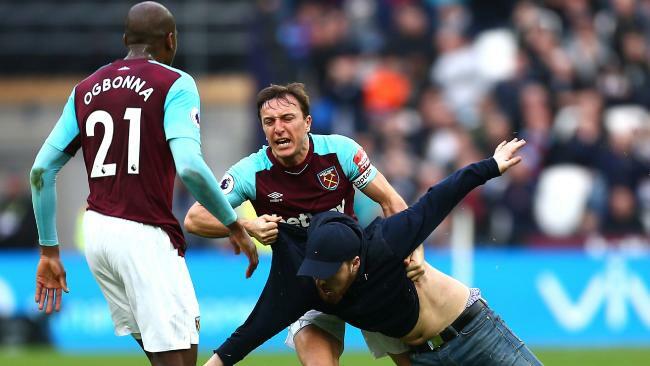 "West Ham United have immediately launched a full and thorough investigation into the incidents which marred the second half of today's match and are committed to taking decisive and appropriate action," said a club statement. Moving from Upton Park, a compact ground where fans were close to the action, to a stadium, which in common with many venues designed primarily for athletics, sees supporters well away from the touchline, has been a repeated source of controversy since West Ham started playing at their new home last season. 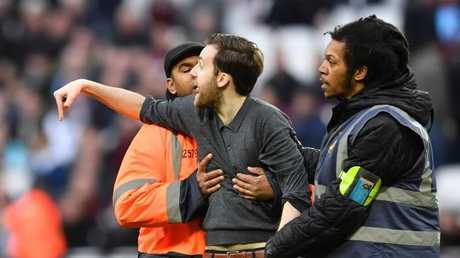 The early months of their time at the London Stadium were marred by several incidents inside the ground, with West Ham and stadium authorities -- the Hammers effectively rent the ground -- arguing over responsibility for correct levels of stewarding and police. Burnley are seventh -- just two points behind Arsenal -- after the latest impressive result in a remarkable season for Sean Dyche's side.